We’d love your help. 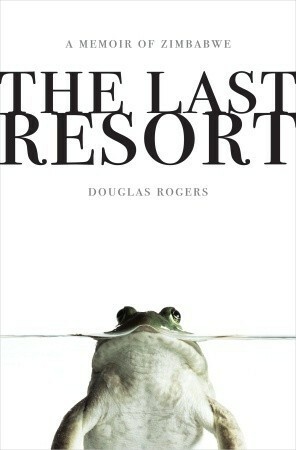 Let us know what’s wrong with this preview of The Last Resort by Douglas Rogers. Thrilling, heartbreaking, and, at times, absurdly funny, The Last Resort is a remarkable true story about one family in a country under siege and a testament to the love, perseverance, and resilience of the human spirit. Born and raised in Zimbabwe, Douglas Rogers is the son of white farmers living through that country’s long and tense transition from postcolonial rule. He Thrilling, heartbreaking, and, at times, absurdly funny, The Last Resort is a remarkable true story about one family in a country under siege and a testament to the love, perseverance, and resilience of the human spirit. Has this book been translated into French? The truth is often more harrowing than anything written as fiction, because fiction necessarily has to have a plot and work to a conclusion and in order to maintain tension (and not to bore the reader) the minutae of a long-drawn out horrific experience cannot be written. This book is about the recent modern times in rural Zimbabwe for whites in business in a small way. These whites have seen that Mugabe did good things - he was a teacher and brought literacy to the blacks freed from the appalli The truth is often more harrowing than anything written as fiction, because fiction necessarily has to have a plot and work to a conclusion and in order to maintain tension (and not to bore the reader) the minutae of a long-drawn out horrific experience cannot be written. This book is about the recent modern times in rural Zimbabwe for whites in business in a small way. These whites have seen that Mugabe did good things - he was a teacher and brought literacy to the blacks freed from the appalling oppression of Ian Smith's white regime. They have also seen his impetus for improvement change to an overweening desire to maintain himself as supremely powerful and because of the consequent paranoia, divide the country much for the worse. The author's parents aren't racist or elitist and regard themselves as thoroughly African and fear being deprived of their land and livelihood, if not their lives. They fear this as whites and as voters for the non-Mugabe party in the last election, rigged as usual. They are rescued in the most brilliant twist ever. Better than any fiction, but also chilling, how one person could take over the lives of others slowly, by stealth and without their permission and have them grateful forever for that even when they realise what has happened. I don't want to spoil it by writing any details. No writer of plots with cunning endings ever thought up anything half so good. Brilliant book, really worth reading. I’m of the opinion that most Americans, even those that consider themselves somewhat knowledgeable about current events and well-read, know very little about modern sub-Saharan Africa. Most of us are aware of the continent’s subjugation to colonial rule and that revolutionary changes have taken place there in recent decades but the sub-division of territories and mélange of unpronounceable names and ever changing leaders seldom moves us below the headlines. The fact that many whites may have los I’m of the opinion that most Americans, even those that consider themselves somewhat knowledgeable about current events and well-read, know very little about modern sub-Saharan Africa. Most of us are aware of the continent’s subjugation to colonial rule and that revolutionary changes have taken place there in recent decades but the sub-division of territories and mélange of unpronounceable names and ever changing leaders seldom moves us below the headlines. The fact that many whites may have lost their superior racial status as well as property leaves us sanguine that it was undoubtedly deserved. This memoir about a white farm family in Zimbabwe, formerly known as Rhodesia, gave me an entirely new perspective. As part of the historical viewpoint, many of the whites were descendents of families that had immigrated there in the early 1600’s and considered themselves, not Dutch or British or even white, but Zimbabwean first. They’ve known nothing else. This is a breathtaking story of adaptation and survival, not only by the author’s family, but by the poverty stricken black populace caught up in a whirlwind of political and cultural upheaval and technological change. This personal account may find you taking sides and cheering on individuals as they are introduced and then being amazed, amused and sometimes horrified at the outcome of events. Yes, I said amused. Some of the events are as surprisingly hilarious as the characters are amazingly heroic and there are lessons here for complacent people everywhere. Zimbabwe is an excellent example of what happens when a group of countries stick their collective nose in another nation's affairs. Back in the day the breakaway state of Rhodesia was a flawed but functioning entity. It's true that there was an uneven distribution of wealth, with whites generally more wealthy than blacks, but this would not not have been a permanent state. The western press naturally had to sensationalize the situation, because that's how you get subscribers...there is no money Zimbabwe is an excellent example of what happens when a group of countries stick their collective nose in another nation's affairs. Back in the day the breakaway state of Rhodesia was a flawed but functioning entity. It's true that there was an uneven distribution of wealth, with whites generally more wealthy than blacks, but this would not not have been a permanent state. The western press naturally had to sensationalize the situation, because that's how you get subscribers...there is no money to be made by reporting that things are getting better. So Rhodesia was sanctioned to death by countries that should have known better. Elections were held at a time when the people were just not ready...the result being that the country, while nominally a democracy, is actually a functioning dictatorship run by a madman. Tens of thousands have been murdered, thousands have had their property taken without compensation, and the Zimbabwean currency is deflated to the point that a suitcase is now called a "Zimbabwean wallet." Mr Rogers' book will take you into a remote area of this nuthouse state where his parents have managed to hang on to their backpacking and tourist resort, once a flourishing business but now at risk of appropriation by any "veteran" (former communist-backed guerilla) who can convince the state to give it to him. It is a very engaging tale of resilience, of survival and of adaptation to rapidly changing circumstances. The reader will probably find that the Zimbabwean situation has been very selectively reported...few know, for example, that black farmers can also be evicted from their lands if they are suspected of not supporting the current "democratic" regime. If you go by what the western media reported, you would probably be surprised to learn that there was such a thing as a black farmer in Zimbabwe. You will also learn that, when an eviction occurs, the people who were employed on the farm are usually also out of work, resulting in a large population of unemployed people with really nowhere to go. Rogers will also introduce you to a salty cast of characters, survivors, hanging on to what was theirs when any rational person would have thrown in the towel. You change and adapt: work for an NGO, become a black market dealer in goods or currency, turn your resort into a brothel. There is no racism here, just people of varying races helping each other out and looking out for each other in the face of the excesses of a lunatic and non-functioning government. The Last Resort is a whirlwind tour through eight years of Zimbabwe's descent from forced evictions of white farmers into the election chaos of 2008. The author visits his parents each year as they adapt to a changing country and struggle to hold onto their small backpacker hotel, Drifter's Inn, in the countryside. Their white farmer neighbors have been kicked out of their homes (some eventually taking refuge at the Inn's cabins), tourism has dried up, and Drifter's is inadvertently reimagined a The Last Resort is a whirlwind tour through eight years of Zimbabwe's descent from forced evictions of white farmers into the election chaos of 2008. The author visits his parents each year as they adapt to a changing country and struggle to hold onto their small backpacker hotel, Drifter's Inn, in the countryside. Their white farmer neighbors have been kicked out of their homes (some eventually taking refuge at the Inn's cabins), tourism has dried up, and Drifter's is inadvertently reimagined as, in turns, a weekend getaway for upperclass black Zimbabweans to take their second wives and mistresses (and ladies of the night), a refugee camp for dispossessed white farmers waiting for their paperwork to clear for resettlement abroad, a diamond smugglers' party oasis, and a hiding place for their newly elected MDC MPs as the election violence rages. The story told is as riveting as it is improbable, and the author's view of the action is kept lighthearted enough to highlight the absurdity of it all: the customers who go to the bank to take out their money to buy something, only to discover upon their return that the price has doubled. The measurement of the real exchange rate by asking someone on the street the cost of 7 eggs. The many characters we meet along the way, all thrown together in a struggle just to survive: a pro-ZANU soldier with a dodgy history and high government connections, the mysterious nephew of a top minister who turns the Drifter's bar around and brings in the nouveau riche diamond trading clientele, the diamond traders themselves, awash in wealth they can't save, and Rogers's stubborn, determined parents making it work. Along the way the reader learns a lot of the post-colonial history of Zimbabwe and a more nuanced view of the political situation, including the historical injustices that have created today's political and economic landscape, than is usually presented. The main flaws in this book are that it's a memoir and necessarily focuses on the times that Rogers is actually in Zimbabwe. When it comes time to leave after his visits, we don't want to fly back to New York with his wife, kid, running water, stocked store shelves, and consistent electricity: we want to stay and hang out with his more interesting 70-year-old parents. Also, when's that Recipes for Disaster: Adventures in the Kitchen of a Failed State cookbook coming out? That's what I want to read. Back in 1998, I hired a guy to build a road onto a 40-acre plot I owned in Eastern Washington. He was a fascinating fellow. He and his wife were saving to buy more land in Zimbabwe, a place they loved. I was shocked. Having spent some rather gnarly years in Jamaica during white flight, and benefiting from what something similar did to real estate prices in the Virgin Islands, I was rather dubious. But he assured me that Zimbabwe was very friendly towards white land owners. He and his wife were c Back in 1998, I hired a guy to build a road onto a 40-acre plot I owned in Eastern Washington. He was a fascinating fellow. He and his wife were saving to buy more land in Zimbabwe, a place they loved. I was shocked. Having spent some rather gnarly years in Jamaica during white flight, and benefiting from what something similar did to real estate prices in the Virgin Islands, I was rather dubious. But he assured me that Zimbabwe was very friendly towards white land owners. He and his wife were creating their dream farm. I always wondered what happened to them. Well, after reading The Last Resort, I know. This is one humdinger of a book, especially since it's true. Travel writer Douglas Rogers grew up in Zimbabwe, and his parents still live there. They ran a backpackers lodge, and Rogers tells the story of his visits home over the years -- as things got increasingly horrific for whites. The lodge eventually turned into a haunt of prostitutes and illegal diamond traders. Most of the neighbors were evicted, kidnapped, tortured or killed. You can't help admiring his parents for their amazing courage (or is it unwillingness to see danger?). To know now that I knew so little about Zimbabwe is nothing short of shameful. To know now that Mugabe still rules there, a decade after this true tale was written, is alarming. Westerners hear what they are sold and we can go on about Syria, Venezuela, N. Korea, Yemen and other hotspots that make the news. But that Zimbabwe still exists as it did, and is still subjugated to Mugabe as it has been for so long, is further proof that good and evil coexist and it will always be this way. W Stunning. But that Zimbabwe still exists as it did, and is still subjugated to Mugabe as it has been for so long, is further proof that good and evil coexist and it will always be this way. We are only impotent and temporary audience members watching the world as it will always be until it becomes our time to leave. As for you, Old man Mugabe, with your billions of dollars in ready assets, and at ninety-two years old, maybe share a million or two here and there with your dehydrated, famished and impoverished nation. What are you saving it for? Central air conditioning in Hell? 4.5 stars. This is the author’s account of his parent’s extraordinary lives in Zimbabwe. The book provides you with a thorough account and timeline of the country’s descend into hell. What makes The Last Resort so amazing, is that this is done with MANY laugh out loud moments. Because of this I was reminded of my favorite memoir of all time – The Glass Castle. Obviously, we also get to witness the horror, and the last chapters had me anxiously turning pages Truth is always stranger than fiction. 4.5 stars. This is the author’s account of his parent’s extraordinary lives in Zimbabwe. The book provides you with a thorough account and timeline of the country’s descend into hell. What makes The Last Resort so amazing, is that this is done with MANY laugh out loud moments. Because of this I was reminded of my favorite memoir of all time – The Glass Castle. Obviously, we also get to witness the horror, and the last chapters had me anxiously turning pages and swallowing tears. The cast is quite extensive and super interesting - think diamond dealers, prostitutes, moneylenders, witch doctors and spies (but never portrayed as stereotypes). The true stars of the book are his parents - over 70 years of age - they never lose hope or their love for this country which has taken so much from them. They always remain open-minded, generous and resilient. If you read only one book about Africa in 2019 make sure it’s this one!!! The only reason it loses half a star is that I really wanted to see some photos. Quite a few books have been written in recent years by exiled children of white Zimbabweans. Many if not all, whether they claim to be autobiographical or not are heavily influence by the feelings of the writer about his lost home country and what is happening there. Some find it impossible to jump over the shadow of bitterness to even attempt a balanced view. That is definitely not the case here. I'm not going to repeat the blurb or the descriptions of many others what this book is about. It's Quite a few books have been written in recent years by exiled children of white Zimbabweans. Many if not all, whether they claim to be autobiographical or not are heavily influence by the feelings of the writer about his lost home country and what is happening there. Some find it impossible to jump over the shadow of bitterness to even attempt a balanced view. That is definitely not the case here. I'm not going to repeat the blurb or the descriptions of many others what this book is about. It's about a son discovering his parents and about the son of a country rediscovering his homeland and its people having lived afar for years. Zimbabwe "An edgy, roller-coaster adventure, it is also a story about how to survive a corrupt Third World dictatorship with a little innovation, humor, bribery, and brothel management." I came across this book while reading the New Yorker's Book Bench blog and after reading the interview with the author I couldn't resist, though I can't say I had much interest or knowledge about Zimbabwe. This book blew me away. I learned so much about the history and culture of Zimbabwe, while being kept on the edge of my seat. To make a long story short, the dictator of Zimbabwe, in an attempt to hide his own incompetence on his country's economic problems decides that the white minority in Zi I came across this book while reading the New Yorker's Book Bench blog and after reading the interview with the author I couldn't resist, though I can't say I had much interest or knowledge about Zimbabwe. This book blew me away. I learned so much about the history and culture of Zimbabwe, while being kept on the edge of my seat. To make a long story short, the dictator of Zimbabwe, in an attempt to hide his own incompetence on his country's economic problems decides that the white minority in Zimbabwe will make a convenient scapegoat. Laws are enacted that take away homes/farms from the white population. This book details the saga of the Rogers' parents trying to keep their home and land. Originally a tourist resort, the Rogers are forced into all sorts of crazy adventures when the tourists disappear and corrupt government officials move in next door. The Rogers' resort turns into a brothel with a marijuana plantation, and later, a gathering place for Blood Diamond trading. Through it all the Rogers ability to remain hopeful is inspiring. I hope one day his Mom's proposed cookbook gets published. This book is a page turner... every time you turn one you think this is when they lose their house, so you have to keep flipping. I'm critical of this work as it purports to be a balanced view of Zimbabwe yet clearly it is not. It does not represent an accurate version of events. There is hypocrisy here and I suggest that it takes a colonial to pick up on it. For example the writer goes out of his way to discuss his Boer roots and the injustices the Boers suffered under the British in South Africa. He describes bad things that happened to white South Africans in South Africa- despite this, and in a memoir of Zimbabweans in I'm critical of this work as it purports to be a balanced view of Zimbabwe yet clearly it is not. It does not represent an accurate version of events. There is hypocrisy here and I suggest that it takes a colonial to pick up on it. For example the writer goes out of his way to discuss his Boer roots and the injustices the Boers suffered under the British in South Africa. He describes bad things that happened to white South Africans in South Africa- despite this, and in a memoir of Zimbabweans in Zimbabwe, there is no mention of the bad things that happened to blacks under the Rhodesian regime. No mention that blacks were not allowed to purchase land - which is crucial to any debate on land ownership. Not even a mention - not a single sausage because that does not affect white people. Not a mention of the discrimination and the bad history. For goodness' sake Mr. Rogers if, during a memoir on Zimbabwe, you leave the country, cross national borders and make a grand effort to discuss the incarceration of your own white folk why is there no mention of the forceable incarceration of black Zimbabweans and their families in wire fenced compounds in Zimbabwe? No mention whatsoever that black families were forcibly held against their will, starved of food and not allowed out without permission? No mention that they were not allowed to farm the land to feed themselves and therefore went hungry under white colonialism. No mention that black families starved under white rule. Why? This is crucial background I am afraid. Is it because in your opinion their suffering was n out as great as yours? We need to tell the whole truth not pieces of the truth. I can only surmise that as a privileged white boy in colonial Africa Mr. Rogers never actually appreciated the suffering that others underwent to accomodate white land use in their own country. We need to be very circumspect indeed when learning the history in this corner of the world. Never forget that next to Zimbabwe is Namibia, a German colony where the 2nd Reich perfected the art of concentration camps, exterminating tens of thousands of black Africans so that colonial whites could usurp their land. That's right, the concentration camps of W.W. II were developed in this corner of the world. And lo and behold we find similar behaviour in a British ex-colony. Land tenure in this country is a complex issue - let alone the laws that restricted employment, education, health and marriage. Black Africans had every reason to fear colonialism - every reason. Mr. Rogers fails to give enough background to this story, pandering to a comfortable mindset that does not wish to be challenged. I could giver other examples in the book however I think it best to leave it at that. Do not read this book and come away believing you have any idea of the fundamentals of this country. You do not. I want writers of courage, writers who get at the truth. We are not idealists Mr. Rogers, we are literate colonials and we want the truth, the whole truth, nothing but the truth. This is an excellent book about extraordinary people living through unbelievable times in Zimbabwe. Over the last few years I have read a number of novels set in that country in the post independence period which have been deeply moving in their depiction of the evolution of that country and the effect on the lives of its people; but none of them delivered their story with the power of this one. It is well written in a journalistic style as opposed to a literary one, which is not meant to demean This is an excellent book about extraordinary people living through unbelievable times in Zimbabwe. Over the last few years I have read a number of novels set in that country in the post independence period which have been deeply moving in their depiction of the evolution of that country and the effect on the lives of its people; but none of them delivered their story with the power of this one. It is well written in a journalistic style as opposed to a literary one, which is not meant to demean it in any way, because the clarity of the writing brings home the mixture of horror, humour and fact. There were times when I was incredulous at the inhumanity of the government and their supporters as well as at the combination of stoicism, pragmatism and bravery shown by the writer's parents, their staff, friends and associates. It is described as a travel book, but in reality it is a very personal history which I think should be essential reading for anyone interested in either sub-Saharan Africa or post colonialism. As I reached the epilogue my mind flicked across to The Eagles' song "The Last Resort", so I looked up the lyrics and, although I don't think that Douglas Rogers had in in mind when he titled the book, I was surprised by its relevance. The Last Resort by Douglas Rogers read by Jack Klaff. Abridged and produced by Jane Marshall Productions. The author tells the story of his parents fight to stay on their backpacker lodge in Zimbabwe despite the political upheaval of the last decade. When he hears the news of the death of the first white farmer, Rogers is concerned for his parents safety but when he returns home to visit them, nothing has prepared him for what he finds. Riveting. Only wish I had read it before my visit to Zimbabwe, so that I could have discussed some of the content with the friends I met there. It has only fueled my interest to learn more. An eye-opening account of life in Zimbabwe under Mugabe's government. Douglas Rogers begins his tale, “The Last Resort,” with one of the first white farm land invasion in Zimbabwe in April 2000, and begins to take readers through the ups and (mostly) downs of the country, including the fight for his parents’ land and survival. Throughout the book, readers learn of the repressive actions taken by the government and the innovative ways in which Zimbabweans deal with them. The Rogers’s resort, Drifters, develops into an informal brothel, Mr. Rogers begins to plant ma Douglas Rogers begins his tale, “The Last Resort,” with one of the first white farm land invasion in Zimbabwe in April 2000, and begins to take readers through the ups and (mostly) downs of the country, including the fight for his parents’ land and survival. Throughout the book, readers learn of the repressive actions taken by the government and the innovative ways in which Zimbabweans deal with them. The Rogers’s resort, Drifters, develops into an informal brothel, Mr. Rogers begins to plant marijuana, the political commissar becomes their new land-hungry neighbor, Drifters’ bar becomes a hot spot for diamond dealers, the Rogers become dangerously involved with the opposing political party: the MDC, and all the while they are constantly fighting to maintain ownership of their land and their right to be Zimbabwean. There are many cultural differences that become evident from reading “The Last Resort,” including heavy racism towards whites (the reverse of what is experienced in the U.S.), and the government’s oppressive role in society. Since the Liberation War, there has been racist tension between blacks and whites. Many whites struggle to be considered Zimbabwean or even African. A common remark to whites is to “go back to Britain. Go back to Blair.” In Rhodesia (Zimbabwe before they were liberated from Britain), five percent of the population was white. Currently, less than one percent of the population is white. The government in Zimbabwe is very repressive and corrupt. Police run illicit trades and many government departments will only make verbal agreements so that they can go back on their word. In result, elections are of very high value to the people of Zimbabwe and what side they support can mean life or death. The secret police, the CIO, constantly torture and kidnap MDC activists. Reporters also risk their lives trying to report on what the government does and what happens in the country. Rogers wrote “The Last Resort” to tell the story of his family’s struggle, as well as the story of those who suffered around him. He told both sides of the clash: other white farmers, like the de Klerks, and their effort to survive, while also adding in the Political Commissar and Walter, the soldier, and their moral battles. Rogers gave background information for almost every person he mentioned because they all had their own unique story that added to the reader’s understanding of life in Zimbabwe and the effects of the government. A recurring theme of resilience and determination tied all the stories in this book neatly together. Roger’s parents never left their land. They never gave up being Zimbabwean. Rogers continually stated phrases such as, “they refused to be victims” and “it was something all Zimbabweans learned” to emphasize their adaptability and determination to stay strong. In almost all the stories that he tells, the character is determined to do, get, or be something, such as getting a herd of cattle back. Rogers also juxtaposes heavy and dark topics with light-hearted and funny events that showcase how Zimbabweans deal with tough times by being resilient and still able to enjoy life and have a laugh every now and then. I enjoyed the stories and history that Rogers wrote neatly and comically together. Not only did I learn so much about Zimbabwe through his book, but I also grew fond of Rogers’s family and friends and wanted to keep reading to see what would happen to them. The only thing that I found difficult about the book was trying to keep track of all of the names and characters that he introduced. Therefore, I would highly recommend the book. A great read. I was 'privileged' enough to have lived through most of the period encompassed by Roger's memoir in Zimbabwe, albeit mainly in Harare. Most of the narrative takes place in vicinity of Mutare which is quite some way off but the politics was national and the problems of hyperinflation and the attendant ills were unavoidable wherever one lived. One thing that will be evident to anyone who has read this book is that many people, white and black, were disenfranchised by the policies of t A great read. I was 'privileged' enough to have lived through most of the period encompassed by Roger's memoir in Zimbabwe, albeit mainly in Harare. Most of the narrative takes place in vicinity of Mutare which is quite some way off but the politics was national and the problems of hyperinflation and the attendant ills were unavoidable wherever one lived. One thing that will be evident to anyone who has read this book is that many people, white and black, were disenfranchised by the policies of the incumbent government. Taken as a purely racial demographic it has been black people of various tribal affinities who have suffered worse in terms of shear loss of life and physical displacement. Rogers alludes to this and gives an estimate of several hundred thousand or more farm labourers who were internally displaced, wandering the country like 'ghosts'. I remember seeing some of these poor souls in the countryside in the vicinity of the Selous farming district: threadbare and desperate. A few paragraphs are given over to those whites like the author's father, who feel an entitlement to be called African by virtue of their ancestors arriving on the shores of the continent several hundred years ago, viz-a-vis the Dutch-Afrikaans peoples. At that time the geopolitical landscape was nothing like it is today. European settlement in the Cape colony spread gradually further north and present day Zimbabwe was only settled by Europeans in the late 19th century. But what of it? It is this: the white tribes banded together and sought a land to call their own. Ian Smith's governement declared a Unilateral Declaration of Independence from the colonial motherland, Britain, and a great deal of effort and life was expended in a decade of civil war. Rogers does a good job of tying this all together. The inclusion of a black combatant in the narrative who survived an atrocious attack on his military training camp highlights the complexity of inter-racial politics. "One party won that war and only one party will ever rule this country" is how he put it and that pretty much sums up the state of affairs. Nothing short of another civil war to my mind will see a transition of power to another political party. I've always been fascinated by Africa, especially after I spent a month in Kenya on a mission trip with my church in 1996. We here in America will sometimes complain about our lives, but it's nothing compared to the poverty I saw while in Kenya. Not even Nairobi is spared; electricity in the capital city is never a guarantee. But at least it's somewhat stable, unlike Zimbabwe, Rogers's home country. When most people think of Africa, we think of white colonists coming over and carving the continen I've always been fascinated by Africa, especially after I spent a month in Kenya on a mission trip with my church in 1996. We here in America will sometimes complain about our lives, but it's nothing compared to the poverty I saw while in Kenya. Not even Nairobi is spared; electricity in the capital city is never a guarantee. But at least it's somewhat stable, unlike Zimbabwe, Rogers's home country. When most people think of Africa, we think of white colonists coming over and carving the continent up into countries convenient for them, ignoring tribal lands and boundaries. So when we hear about the colonists losing their privileged status, perhaps we are a little glad to see the land reverting back to its native sons and daughters. Yet Rogers's family has been in Zimbabwe (or Rhodesia, as it was known before independence) for longer than the United States has been its own nation. Should these white settlers, who have been in Zimbabwe for hundreds of years, be thrown out even though they feel that they too are part of the fabric of that nation? By that metric, all of the whites in America should return to their countries of origin. This is a fascinating account of Rogers's parents, who love Zimbabwe with all their hearts, and who are eager to see a country unified and whole with people of all colors who have made it their home. They own a place called Drifters, which had once been a hostel of sorts, but which also turned into somewhat of a brothel once lawlessness began to descend upon Zimbabwe. Reading about the corruption and the rampant inflation (Zimbabwean dollars are pretty much worthless; you can be a billionaire and still be desperately poor) and the inability to hold an honest election makes my heart ache, but somehow Rogers's parents learn how to survive in the face of famine and food shortages and a lack of electricity. To leave Zimbabwe, the land that they love, is unthinkable for them, even if staying is downright terrifying. This memoir started slowly for me. I got distracted by the lengthy passages of dialogue framed in quotes. I kept thinking, "Is that REALLY what that person said?" But several friends really liked this book, so I stuck with it and -- sure enough -- the absurdity and brutality that makes for 21st century Zimbabwe swept me up. I finished the book today in a big gulp and am now dying to know what happens to Douglas Rogers' parents. (Random House, please include an update!) It's a fleshed-out read ab This memoir started slowly for me. I got distracted by the lengthy passages of dialogue framed in quotes. I kept thinking, "Is that REALLY what that person said?" But several friends really liked this book, so I stuck with it and -- sure enough -- the absurdity and brutality that makes for 21st century Zimbabwe swept me up. I finished the book today in a big gulp and am now dying to know what happens to Douglas Rogers' parents. (Random House, please include an update!) It's a fleshed-out read about a country in great peril and it will certainly inform how I read about what's happening under Robert Mugabe's terrible rule. It's really more of a 3.5 for me. If you enjoyed Alexandra Fuller's memoirs of growing up in Africa, so too will you enjoy The Last Resort, which is in the same vein. I adored this portrait of life in a country where instability has been the norm and adaptation has been the key to survival. It was witty, frightening, and heartening. Incredibly well-written. This book is one of my favorite reads, and I would recommend it to anyone who is interested in seeing what life is like in Zimbabwe. This review has been hidden because it contains spoilers. To view it, click here. Read by Jack Klaff. Abridged and produced by Jane Marshall Productions. BBC blurb - The author tells the story of his parents fight to stay on their backpacker lodge in Zimbabwe despite the political upheaval of the last decade. When he hears the news of the death of the first white farmer, Rogers is concerned for his parents safety but when he returns home to visit them, nothing has prepared him for what he finds. great family story of zimbabwe, folks who own the Drifters lodge. zim is increadibly screwed up (20,000% inflation, elections marred by murder and beatings, out-of-control govt graft, starvation, etc...) what makes this a great read are the characters we get to know. good job by a white zim, who finally sees the black side too. its sad though. this is a good update to alexandra fuller's 2 memoirs of zim up to 1980's. it hasn't gotten any better. nice going usa. Very good book. Recommended to anyone interested in Zimbabwe's current affairs and the real life of its habitants, seen through the point of view of a Zimbabwean expat that loves his country, but it is not blinded by a nostalgic memory of the old times. Wonderful and true account of the past 10 years of life and strife in Zimbabwe, as Mugabe sends the country into ruin. The author's parents own "Drifters", a resort/lodge and he visits them off and on, learning about their struggles. I wasn't so sure when I started reading this ... but I really enjoyed it and found it a fascinating read. I'd recommend it.